Apples are a super healthy snack. They’re full of vitamins and antioxidants and they pack lots of health benefits. But what if you’re watching your weight? Don’t worry. Calories vary by size, but a medium apple has only about 95 calories and it’s stuffed full of all kinds of goodness. See the chart below for various sizes and forms of apples. They make the perfect snack. The quick answer: for a 100g serving, there are 52 calories in an apple. But that’s not really very useful, since you don’t weigh apples before you eat them. (I sure don’t!) You can estimate the calories by apple size. They range from about 50 to about 115 calories per apple. See the chart for the estimated calories for various apple sizes. (If you want to know about apple carbs, fiber, protein, vitamins, minerals, etc., see our Apple Health Benefits and Nutrition Facts page. If you are trying to judge apple size, note that 3 – 5 pound bags of apples usually contain small and extra small apples. *Apples vary: sizes and corresponding weights are approximate. delicious, and red delicious apple varieties. See References and Sources for more info. You should always eat apples with the skin, because most of the fiber, vitamins and antioxidants are in the skin. Plus, you don’t save many calories by removing the skin. Just be sure to always wash the apples well before you eat them, since they may contain wax or pesticide residue that you should avoid eating. But if you decide to eat them without the skin anyway, see the “Apple Calories Without Skin” chart to find out the calories you’ll be eating. **Calories based on the weight shown in grams. It’s best to eat fresh (raw) apples. But you’ll find them in many other forms. See the “Calories for Various Forms of Apples” chart for the calories you’ll get from each. The old saying “an apple a day keeps the doctor away” was right! Apples are full of all kinds of healthy goodness. 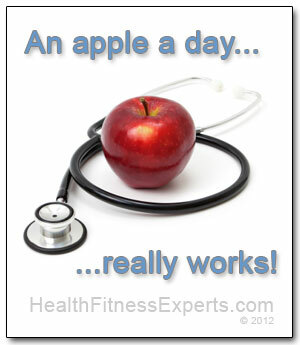 We’ve written a separate article to dive into the health benefits of apples. Check out our Apple Health Benefits and Nutrition Facts page to find out more. We love apples. Did you know that there are over 2,500 varieties of apples grown in the United States, and over 7,500 around the world? But the only apple native to North America is the crab apple. Not so yummy. But luckily, there are now all kinds of apples growing and available in North America (and everywhere else). And as with many other things, it all started with the pilgrims in Massachusetts who planted the first apple trees in the United States. Of all the different apple varieties, there are typically only a few that you can find in grocery stores or farmer’s markets. The most popular are the sweet tasting Red Delicious and the tart Granny Smith. Some of the other apples you might find are the Golden Delicious, Jonathan, Empire, Fuji, Gala, McIntosh and Cortland varieties. But with the growing popularity of farmer’s markets and a return to whole foods, you can find an increasing number of apple varieties — along with purple carrots and heirloom tomatoes. If you want to find out more about apples, the University of Illinois has a really interesting list of Apple Facts, and Purdue University has an interesting outline of Great Moments in Apple History. 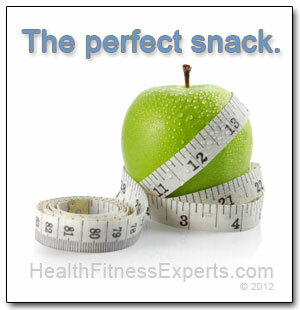 And next time you reach for a snack, remember that an apple is always a healthy choice! United States. Department of Agriculture and Department of Health and Human Services. Dietary Guidelines for Americans, 2010. University of Illinois at Urbana-Champaign. University of Illinois Extension. Urban Programs Resource Network.